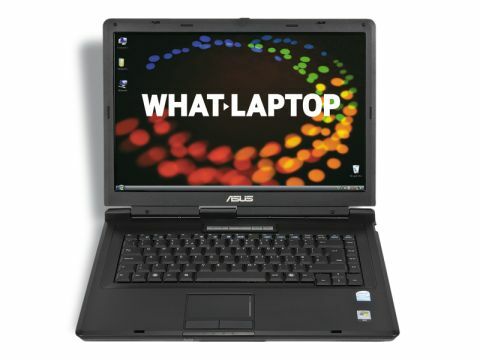 Asus' comprehensive laptop range covers all sectors of the market, from low-powered entry-level systems to high-end media centres. While the X58L is a resilient and well-made machine, it struggles to stand out from the crowd in any specific area. The plain, black chassis is made from hardwearing plastics. The thick screen panel adds bulk to the overall appearance, but provides ample protection. Its nondescript design may not win any awards, but the chequered pattern finish adds a touch of style. It's a fairly light laptop at just 2.4kg. While it's not ideal for frequent travel use, you can work in comfort on short journeys. The 159-minute battery life falls short of the three-hour minimum we expect, but allows for basic travel use. The user interface is unexciting but functional. The keyboard's design also lacks flair, but the board is firm and responsive with all the keys moving smoothly. The large touchpad and mouse buttons are equally staid yet usable. The most notable feature here is the vibrant 15.4-inch screen. Its glossy Super- TFT coating means colours pop off the screen. Contrast and black levels are also impressive. While the glossy coating increases reflections, the bright panel is easy to view in bright conditions. As with all laptops at this price, performance is basic. The single–core Intel Celeron processor and 1024MB of memory suit daily office use and browsing the internet, but it quickly shows its limitations when attempting anything more taxing. This low level of performance is also mirrored in the use of an integrated Intel graphics chip. While it delivers enough power for watching movies and running basic games, it is a low performer overall. While the 120GB hard drive provides ample space for family use, all three rivals here better it. The dual-layer DVD rewriter and 4-in-1 card reader are more pleasing, and provide read/write access to CDs, DVDs and flash storage cards. Due to the low price, extra features are almost non-existent. Tools for internet security and CD/DVD creation are installed, but there is no home office software included. This bare-bones package is quite common at this price, so you'll need to budget for any extras you'll need.